The Betfair Poker, Caesar’s Cup is set to run along with this years WSOPE. The Caesar’s Cup Team event, which has a similar format to Golf’s Ryder Cup where the American’s take on the Europeans, will start on September 26th. However, with over a month to go, captains for each team have already been chosen. 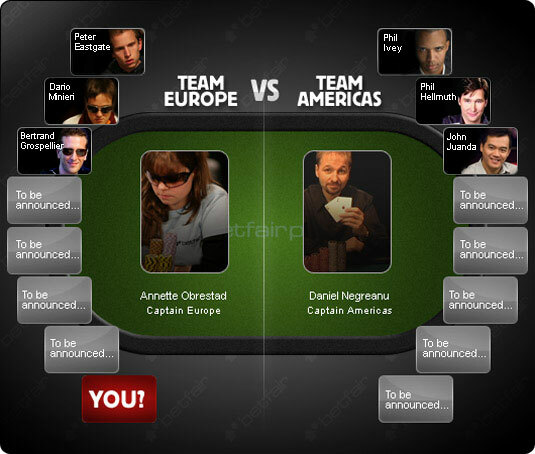 The Americans have chosen Daniel Negreanu as their team captain, plus also confirmed Phil Hellmuth, Phil Ivey and John Juanda as the other members of Team America. The Europeans have also confirmed Annette Obrestad as their team captain. Obrestad has also picked the first three other members of the European team. Bertrand “ElkY” Grospellier, Dario Minieri and Peter Eastgate are the first three players to be confirmed. Betfair Poker will also be running tournaments online to fill the final space in the European team. The Caesar’s Cup will also be filmed for television. So this give any poker wannabe the chance of fame and fortune. This entry was posted on Wednesday, August 19th, 2009 at 9:01 pm and is filed under Poker News. You can follow any responses to this entry through the RSS 2.0 feed. You can leave a response, or trackback from your own site.